Planetary alignment? Whatever. I’ll take it. If you noticed a shift of the Earth’s axis around 7:30 pm (CST) this evening, don’t be alarmed. I have an explanation. The shift you felt was a direct effect of the alignment of the planets that occurred at about the same time. In addition to the axial tilt you may have noticed, the alignment of the planets also caused Derby and I to have a very nice ride tonight. At this point, the planetary alignment theory makes good sense, because there is no way around it, I’ve been riding like absolute shite for the last week. Actually, Christy and I kicked some theories around while grazing our horses afterward, but first, let me tell you how the evening went down. I prodded Derby’s back and didn’t love what I saw. While he wasn’t super-sore, his back was reactive. I hemmed and hawed, and then decided to tack him up. They were in today due to thunderstorms, and if I didn’t decide to ride, we’d have a longe session instead. I told Christy what was going on, and what worried me. I was prepared mentally to deal with the balking and backing I was starting to experience. Dealing with those behaviors is actually something I have some experience with, and Derby isn’t a scary customer. But I get uncomfortable very quickly when the horse is off. I refuse to punish a horse that is resisting due to pain. To do so is not only rotten horsemanship, it’s patently unfair. So I leveled with Christy, telling her that he was a bit sore, and voicing my trepidation. We talked through it, and I decided to get on, and see what we had. If he wasn’t feeling good, I’d hop off. After we walked for a few minutes, I started bending Derby on a shallow serpentine. “That looks good,” said Christy, and it felt good, too – Derby was moving easily. We picked up a trot, and after the obligatory clearing of the pipes, we did a couple laps at a snappier pace, and all was looking good. So we cut the the chase and rode the tests. And we rode them well. Derby was round, steady, and really reaching for the contact. 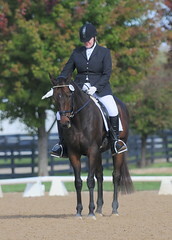 I went through Intro A in silence, as Christy was stunned into speechlessness. We were both thrilled. I hopped to and started Intro B. That one rode even better. Derby stayed round, was very responsive off my legs, and continued to seek the contact. We were an entirely different horse and rider. Now, don’t take this the wrong way when I say that it was easy. I was able to maintain myself comfortably and balanced in my new position without having to think about it. As a result, I rode much more forwardly and stayed balanced. I was able to take my foot off the virtual brake that my unsteadiness caused. God, what a relief tonight was. I was wondering what in Heaven’s name was happening to us. We’re back on the path to respectability. And Training Level.